As expected, Black Friday is once again predicted to be the biggest shopping day of the year. Nowadays nearly every online retailer and B2C business owner gets involved in the event, with many beginning their preparations months in advance. Once you’ve decided to run a Black Friday offer, you need to market it to ensure that it’s seen by your audience. Black Friday is next month (Nov 23rd) but that doesn’t mean you’ve left it too late if you’ve not started your efforts yet. Have a look at some of our top tips for capitalising on the Black Friday trend quickly and without stretching your budget! There’s a huge volume of users searching for a bargain on the day across Twitter and Instagram, so make sure your company is seen by using the relevant hashtags! #BlackFriday is the most popular hashtag, so to be sure to look out on the thread for ways you can interact. Run your sale easily and hassle-free without having to alter your product prices in your website inventory with the use of discount codes ! It’s easy to create discount codes in the back end of your website and these can be time sensitive to apply for one day only. These discount codes can also be shared by your affiliate network, if you’re running an existing affiliate/influencer programme – giving an extended reach for your promotion. You don’t have to offer a money-off incentive to be in with a look-in on Black Friday. Offer a complimentary service, like ‘free installation’ or ’free delivery’ to entice your consumers into a purchase. Your website banner is the first thing a user will see when they land on your website, so what better a place to push your Black Friday offer? 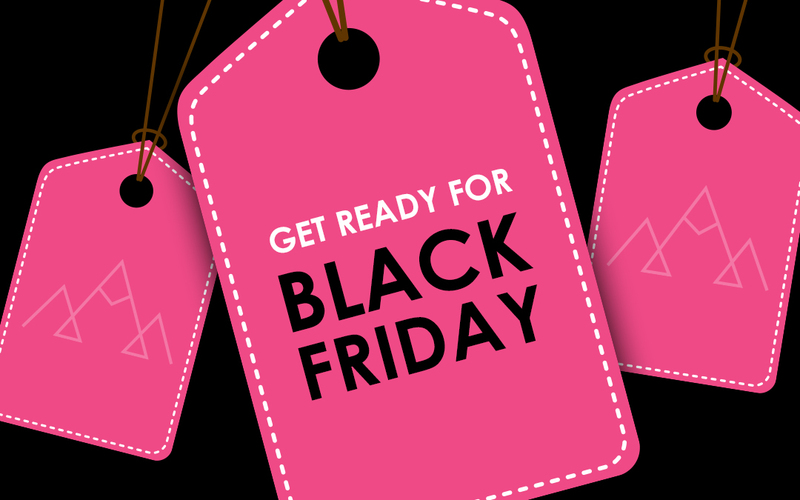 Change the banner to a striking Black Friday-themed image, list your offer and link it through to the relevant landing page. Plus don’t forget, this doesn’t have to be a one-day only occurrence. Changing the banner over a few days in advance will let visitors know that you’ll be partaking in Black Friday offers and encourage them to return to the website on the day. Quick to design and even quicker to post out, Black Friday-themed social media graphics are a great way to catch your consumer’s eye! Schedule the posts to go out consistently during the day or, even better, be online yourself to ensure you can interact with customers and create a real-time buzz around the event. Give your subscribers an exclusive reward by emailing a discount code to use on Black Friday. These special deals have the added advantage of making your existing audience feel rewarded for being a loyal customer, building on your long-term relationship. Do you already run a remarketing campaign targeting previous visitors to your website? That’s a perfect channel to push your Black Friday offer on. Don’t forget, just like your website banner you don’t just have to do the changeover on the day itself – begin targeting the new banners at users a week in advance and build up some excitement around the brand! For more information on remarketing, find out here. Cyber monday is the slightly less heard of (but no less engaged) partner of Black Friday, and it’s a second chance for businesses to get on the hype. Occurring the Monday after Black Friday (Nov 26th this year), Cyber Monday focuses specifically on online shopping deals – the perfect opportunity to push your website promotions! Need Help With Your Black Friday Marketing Campaign? At Peaky Digital our team are happy to help you plan and deliver Black Friday campaigns of all sizes. To find out more get in touch today.